Each condo has 2BRs,2baths, kitchen, DR ,LR, oceanfront deck, laundry & parking! Enjoy the bold and expansive ocean views and high end furnishings in this luxurious oceanfront apartment in Ogunquit's famous Perkins Cove harbor. 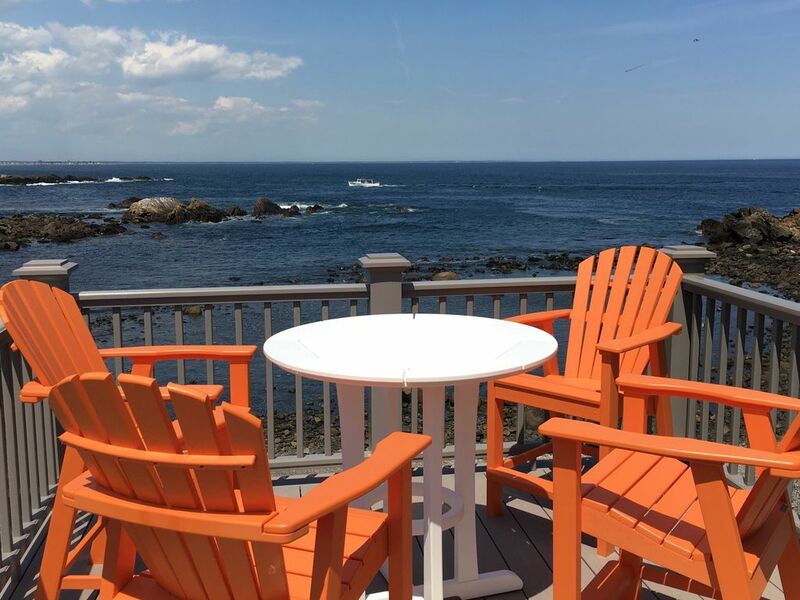 Each oceanfront apartment boasts amazing views of the Atlantic Ocean, Ogunquit's famous clifftop footpath the Marginal Way and the historic white drawbridge that marks the entrance into the harbor. Each single floor apartment has 2 bedrooms, 2 baths, full kitchen, dining area, living room and outside deck overlooking the ocean. There are two onsite parking spaces dedicated to each apartment which is a true rarity in Perkins Cove! In addition to the oceanfront outside decks, both apartments have access to the oceanfront patio space at the ground level as well as exclusive use of the pebble beach. Restaurants and shops are steps away. Fresh linens and towels are provided via a linen delivery service, and everything will be ready for your arrival. The first floor apartment has been completely remodeled with custom, high end finishings. The apartment has an open floor plan for the kitchen, dining and living room space with wall to wall windows facing the ocean. The kitchen has custom cabinetry, specialty granite countertops and stainless steel appliances. A brand new oceanfront deck is off the kitchen area. The entire apartment flooring is tile and hardwood. Both bathrooms have custom tile showers and tile floors. The master bathroom has a soaking tub with a flat screen tv within view as well as heated tile floors. The master bedroom has french doors that open out directly to the pebble beach and ocean. The apartment has air conditioning for the warmer months and a gas fireplace in the living room for colder months. The updated second floor apartment boasts breathtaking ocean views inside and outside. The kitchen has new new granite countertops with accompanying stainless steel appliances, and the kitchen is open to the living and dining areas. The outside deck off of the kitchen has oceanfront patio seating for four. There are wall to wall windows facing the ocean visible from the kitchen, dining, living room and master bedroom. Brand new coastal cottage furniture has been purchased for the season for both second floor bedrooms. Please email to inquire about availability since the rental calendar isn't always accurate. Weeks fill up quickly! Discounts are available for weekly booking in the shoulder seasons. The quaint port of Perkin's Cove is home to many activities like deep sea fishing trips, scenic cruises along the Maine coast, private charter boats, shopping and art galleries. Steps away from the apartment there are numerous dining opportunities that include local institution Barnacle Billy's, lobster rolls and chowder at the well established Lobster Shack, or fine dining at MC Perkins Cove. The heart of Ogunquit and Ogunquit Beach are easily accessible by strolling along the famous Marginal Way footpath known for it's breathtaking ocean views, or take one of Ogunquit's charming trolleys that wind along Shore Road with numerous stops along the way for guests to disembark, and visit the many restaurants, shops and art galleries that Ogunquit is famous for. The trolleys bring visitors to Ogunquit center and Ogunquit Beach which was recently recognized as one of the top ten beaches in the United States! Of course, travel by car is always an option. The Cape Neddick Golf Course is a couple miles from this property. For hikers and cyclists, Mount Agamenticus in York and Laudholm Farm in Wells are home to many beautiful trails. For art enthusiasts, the famous Ogunquit Museum of Art is less than a mile from the property, and the Portland Museum of Art is a 40 minute drive up the Maine coast. For a magical evening of summer stock theatre, the famous Ogunquit Playhouse is less than two miles from this apartment. After all of this activity, guests can come back to this oceanfront property to relax with the choice of sitting on the deck, patio area or the small pebble beach all with breathtaking views of the Atlantic Ocean. You will quickly release while watching and listening to the calming rhythm of the waves. With recharged batteries, stroll along the tidal pool looking for shells and seaglass. This property has a unique combination of beauty and peace that can only come with an oceanfront location, as well as the amenities and activities that Ogunquit is famous for just steps away. This family owned property was purchased in 2004. Growing up in Massachusetts, the family has owned a summer residence in Ogunquit since 1983. All family members now call Maine home year round. Park your car and walk to all of Ogunquit. Space for two cars per unit is provided. Parking in Perkins Cove is a real rarity! You'll be able to walk Marginal Way to the little beaches with a 20 minute stroll, or take the trolley from Perkins Cove to Big Beach for a day of white sand on this spectacular 3.5 mile beach. After a day at the beach or around town, you can return to the property to sit on the outside deck overlooking the breathtaking Atlantic Ocean. Master bedroom bathroom is a three quarter bath. The second bathroom is a full bathroom with custom tile walls and floor with fiberglass tub. Fresh towels are provided by local laundry service. Kayaking and stand up paddle boarding can be accessed steps away from the apartment. Kayaks and SUP are not provided as part of the rental. Each apartment has a deck overlooking the Atlantic Ocean off of the kitchen. Each apartment also has use of dedicated area on a beach pebble patio area at the ground level of the building. Ogunquit has town courts open to public use about three miles from the property. Cape Neddick Golf Course is less than two miles from the property. My family loves the coast of Maine for vacation. This is our second stay in this fabulous home with every imaginable amenity. Beautiful views and cool breezes right on the beach/water! Literally steps from the Marginal Way, quaint shops, fabulous food, and lots of activities or relaxation - your pleasure. Carrie is delightful and always has everything set up in pristine condition. In addition, she shares a plethora of suggestions for great places to dine - although we find that our favorite dining spot is the house - for convenience and beauty. We grilled steaks outdoors and even cooked fresh lobster off the boat! The home has everything you need and more! Whether it's coffee on the deck at sunrise or relaxing with a glass of wine at sunset, you will not find a more perfect location. We are certainly looking forward to next year!! Wish I could give more stars on the rating - it's pure perfection! The "Girls" found this wonderful gem 3 years ago. The beautiful ocean views,sounds and excellent location can't be beat. The apt is beautifully decorated, well stocked and very comfortable. We always look forward to seeing Carrie every year. She is very accommodating and helpful. We park the car and barely use it. The Marginial Way and the great restaurants and shops in Perkins Cove are just steps away. The Ogunquit village and playhouse 15 min walk away. We look forward to our 2018 visit! A piece of "Heaven" in the Cove!! We arrived for our Memorial Day getaway only to be personally greeted by Carrie, who graciously gave us the tour of the upper unit and filled us in about the cove area. Needless to say, I don't think you will find a better ocean & cove view in this area. One of the "highlights" of our stay is that we got to witness a "coastal" storm from the comfort of the living room. The morning oceanside sunrises were also breathtaking! The unit is very comfortable and masterfully decorated. You can feel and appreciate all the comforts that Carrie has placed throughout this place. The outside deck boasts amazing views of the ocean while relaxing in the high back Adirondack chairs. The beds were super comfy and the main bedroom boasts it's own bathroom & shower, along with a sitting area that looks out to the ocean. Along with the "awesome" views, it was especially nice to walk through the cove area and visit the shops without having to worry about parking. I don't think you can really do justice in a "review" on how well this place will make your stay an enjoyable one. You will not be disappointed!! We have been spending time in the Ogunquit area for many years, and have rented any number of places. Our stay this time was perhaps the best ever. The location was wonderful, the furnishings were comfortable as well as beautiful and everything were could possibly use was there. We particularly enjoyed sitting on the deck and soaking it all in. We would recommend a stay to family and friends at the drop of a hat. Awesome! Warm and welcoming décor throughout exceeds the average vacation accommodations. Quality high-end appliances and comfortable furnishings are only exceeded by the marvelous ocean-side location. If you enjoy the sights and sounds of the rugged Maine coastline, you’ll love this condo. Marginal Way entrance is a few minutes walk, as is an inspiring Museum of American Art. Walk the Marginal Way and you’ll find yourself in the Center of Ogunquit, stop at the Village Market for a good cup of coffee and a variety of sandwiches. We also visited its neighboring ice cream shop - Yummie. Ten minute drive to Nubble Lighthouse and the town of York with its clean beaches and interesting shops. We’ve had accommodations in Ogunquit, Wells and Boothbay Maine but none match Perkins Cove. Carrie, our Hostess, greeted us upon arrival and immediately made us feel like family – Thank You Carrie. We give this VRBO 5-stars and would welcome the opportunity of another stay. What a terrific location with beautiful ocean views! This well appointed second floor apartment was very clean, comfortable and impressively decorated. Plenty of opportunity to walk (we were on the Marginal Way in less than 5 minutes), shop and dine (numerous choices) without taking the car out. Having a lobster dinner delivered and enjoying it on the deck while the sun was setting was a particularly memorable experience for the four of us. Expansive ocean views and Ogunquit's New England small town charm are the hallmarks of this Perkins Cove property which has two one floor apartments. Each oceanfront apartment has 2 bedrooms, 2 baths, a full kitchen, dining room and living room and an outside deck. The property offers amazing views of the Atlantic Ocean, Ogunquit's famous clifftop footpath the Marginal Way and the historic white drawbridge that marks the entrance into the harbor are . Each apartment comes with two dedicated parking spaces. The heart of Ogunquit is easily accessible by strolling along the famous Marginal Way footpath known for it's breathtaking ocean views, or one of the charming trolleys that wind along Shore Road with numerous stops along the way for guests to disembark, and visit the many restaurants, shops and art galleries that Ogunquit is famous for. The trolleys bring visitors to Ogunquit center, and Ogunquit Beach which was recently recognized as one of the top ten beaches in the United States! Of course, travel by car is always an option. For golfers, the Cape Neddick Golf Course is less than two miles from this property. For hikers and cyclists, Mount Agamenticus in York and Laudholm Farm in Wells are home to many beautiful trails. For art enthusiasts, the famous Ogunquit Museum of Art is less than a mile from the property, and the Portland Museum of Art is a 40 minute drive up the Maine coast. For a magical evening of summer stock theatre, the famous Ogunquit Playhouse is less than two miles from this apartment. After all of this activity, guests can come back to this oceanfront property to relax, and sit on the pebble beach watching and listening to the calming rhythm of the waves. Once batteries are recharged, looking for shells and sea glass in the tidal pools is another favorite activity of guests. Bring your kayak or SUP to cruise along and enjoy the wonders of Maine's coastline all accessible from this unique location. This property has a unique combination of beauty and peace that can only come with an oceanfront location as well as the amenities and activities that Ogunquit is famous for just steps away.